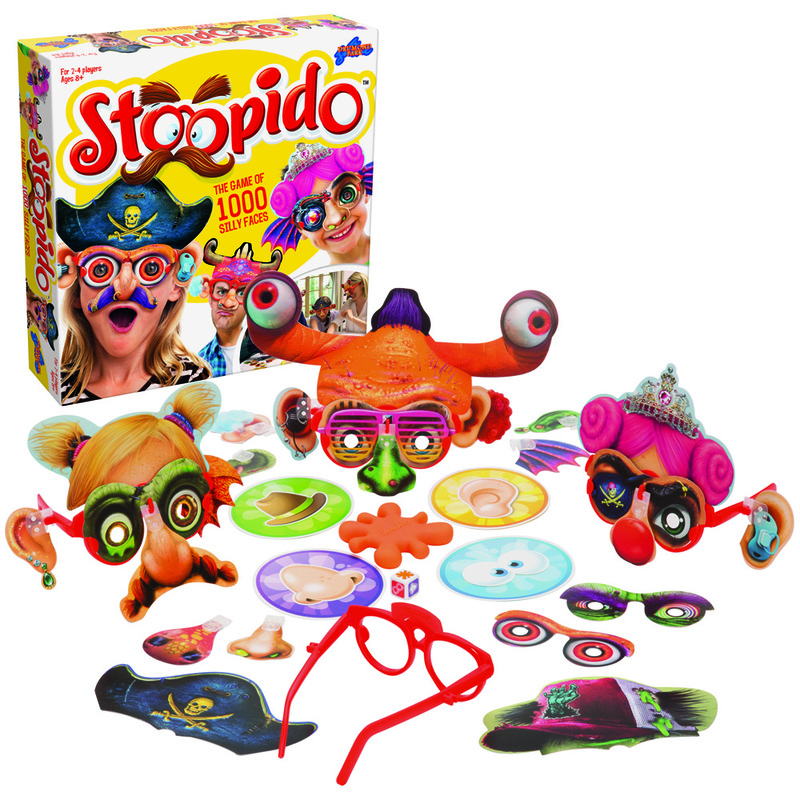 Stoopido from Drumond park, the game of a 1000 silly faces for ages 8 + rrp £17.99. This game is new for 2016 and ideal for a brilliant, silly and wacky hilarious party game for Christmas that everyone in the family will absolutely love. The aim of the game is quite the opposite of what you are most likely thinking, the winner is actually the person without a face full of quirky eyes, ears and mismatched features, with the throw of a dice and the quick fire slap of a hand this merciless game will have everyone laughing throughout!! 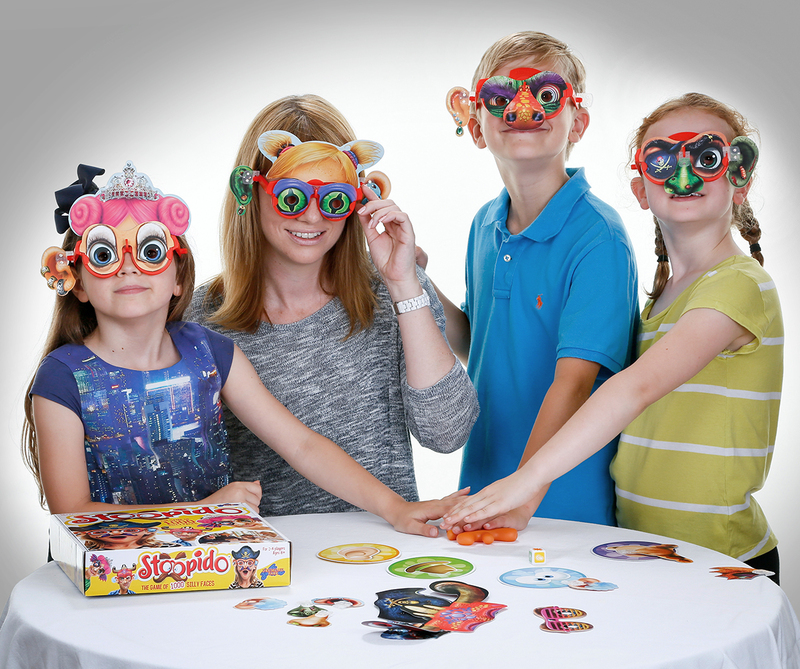 How to play - each player has a pair of red Stoopido spectacles to wear, and the 'stoopitoot' is placed in the middle of the table with the four 'slap pads' placed around it, the double sided Stoopido face pieces are piled beside each slap pad....now your ready to play! If you roll the Nose, Eyes, Hat or Ears, players race to slap the corresponding slap pad, the player that gets there first gets to choose one of the face pieces off that pile and place it on the glasses of any player already not wearing a piece of that feature. If you roll the Glasses - bad luck - the player to your left gets to pick any feature you do not already have and place it on your glasses. If you roll the 'Stoopitoot' the player who gets there first and squeaks it can choose to pick a Stoopido face piece of any feature and place it on any player OR remove a piece from their own glasses and return it to the correct pile. Once a players glasses are full they must sit out but look 'Stoopido' for the remainder of the game wearing their glasses, the game continues until there is only one player remaining with out a full face of Stoopido face pieces on their glasses...The winner!!! Because of the endless combinations of all the crazy, colourful and wacky facial parts, this game is enjoyable time and time again by people of all ages, guaranteed to be a big hit with everyone. We had such a hilarious afternoon playing Stoopido with the eldest and had some real belly laughs while playing, he absolutely loved it, already planning play dates to be able to play it with his friends, I am sure the game will be top of the to play list for a long time yet on wet, windy weekend afternoons, i am thinking it may make an appearance at our dinner parties too!!! I am running a giveaway to win one these hilarious games, so to be in with a chance to enter complete the form below by 2nd Dec.
Looks like such a fun game, the twins would love it. Fun game to play at Christmas! this game looks great fun! What a fantastic giveaway! Thanks for the chance. This looks perfect for after Christmas Dinner! Looks like great family fun! this looks like such a family fun game! This game looks like great fun! Would love to win! This looks like a great game for Christmas Day! Looks like a fun game! Would love this for the childcare setting where I work. Great Game. Thanks for the chance. I would love to win this so we could all play it at Christmas! This looks like so much fun, I'm sure kids games are better now than when I was a little girl. My son really wants this game! A perfect family game for Christmas. Many thanks for the opportunity. This looks like great fum, always looking for new board games at Christmas. Great game for Christmas. I have a son and two step sons and they like games that have a really fun element like this. Nothing like games after Christmas dinner! Great prize. Thanks for the competition.